The University of Alaska Board of Regents on Tuesday appointed Dr. Jim Johnsen as the next university president. 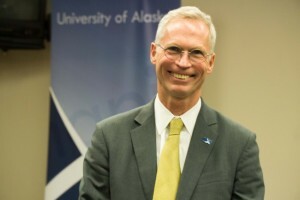 In the weeks leading up to the Board of Regent’s unanimous vote appointing Johnsen as the next University of Alaska president, he spent time traveling to several campuses to talk with a variety of university constituents. Jo Heckman is the chair of the Board of Regents. She says the board spent time reviewing feedback from those constituents before making a decision. Overall, Heckman says Johnsen was well received. Johnsen was the only candidate still in the running for the job and was the sole finalist put forward by the Board of Regents in early June. Heckman says Johnsen’s first, most-pressing task will be addressing next year’s budget, which is already in development. The university faced a $28 million shortfall last year. On top of tackling the budget, Heckman says Johnsen also committed to visiting every university campus during his first year. Johnsen is on a 5-year contract, making $325,000 dollars annually. There will also be the possibility of an annual performance bonus of up to $75,000 dollars – which will be based on several still-to-be-determined metrics the incoming president and Board of Regents will set by the end of September.